The Boxwood blight was first founded in the United Kingdom in the 1990’s, but at that point it was not formally named. It was named Cylindrocladium psuedonaviculatum in New Zealand in 2002. Another name for this disease is Cylindrocladium buxicola, which is from the UK (Douglas). The disease was previously European based but has recently been found in North Carolina, Virginia and other states as well as British Columbia, therefore the probability of the disease migrating to Ontario has increased substantially. There are three species of boxwoods that grow in the United States that are susceptible to the boxwood blight. They are Buxus semprvirens, Buxus microphylla, and Buxus sinica var. insularis. The full ranges of hosts are not yet known, but there is no published evidence of any other hosts at this time. Certain types of boxwood are more susceptible to this disease, likely due to physical features. For example the Buxus sempervirens (English boxwood) has cupped foliage (Ivors). The following are symptoms of the boxwood blight as said by Dr. Sharon Douglas from the Connecticut Agricultural Experiment Station. 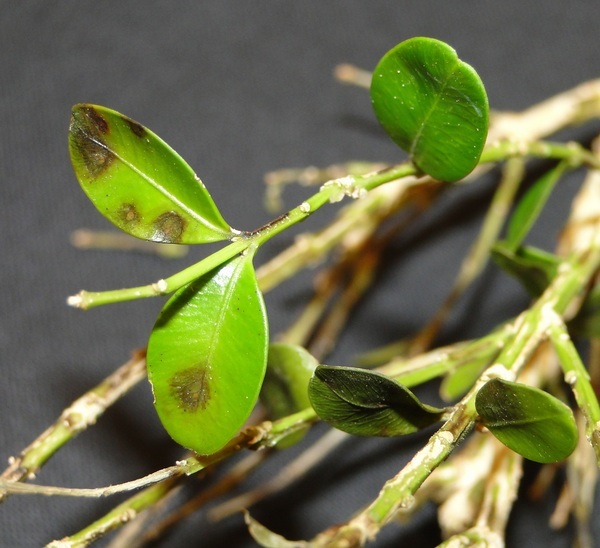 Stems are also affected by the boxwood blight. This results in dark brown or black lesions on all parts of the stems. As well, heavily infected plants loose their leaves. These plants do try and regrow their leaves but, with repeated infection the roots become weakened and the plants may die. This is especially true for young plants or new transplants (Douglas). This particular disease is spread through water; splashing rain, flood water, overheard irrigation and droplets of water carried by the wind are all ways in which the disease can travel. As well, tools, equipment, and animals can carry the spores (Goodwin). It also should be kept in mind that the pores are very sticky and are therefore unlikely to travel long distances by wind (Ivors). The conditions that the fungus thrives in are damp, shaded, and have poor ventilation (Richards). The ideal temperature is 18°C to 25°C. The fungus is sensitive to high temperatures and is killed at temperatures above 33°C. The pathogen can survive for at least five years by remaining on decomposing fallen leaves (Godwin); therefore the best way to get rid of the pathogen is by burning it to ash (Ivors). Composting it near the growth of other susceptible species is not recommended. To avoid the spread of the boxwood blight, it is recommended to steer clear of the above conditions. Avoid using overhead irrigation; watering the roots is a possibility as buxus do not require foliage irrigation (Richards), also do not handle the plants when they are wet. All newly purchased plants or root cuttings should be kept separate from existing boxwood plantings for at least one month to ensure that no disease is present. Be sure to keep space between plants in order to maximize air circulation. Sanitation is vital and is achieved by raking and removing leaf debris. Another important aspect is to remove whole plants as soon as boxwood blight symptoms are detected (Douglas). At this point there are no fungicides found that kill this particular fungus or even act as a successful deterant (Henricot). A preventative measure is to spray VaporGard all over the plants every three months. VaporGard is a spray that is used to reduce water transpiration and reduce moisture loss from plants. This can be used as a preventative measure because the VaporGard creates a film over all parts of the plant that cannot be penetrated by the disease. VaporGard does not hinder the plant in any way, and used in conjunction with the above avoidance measures can really do wonders in keeping the Buxus plant in prime condition (Richards). Although Cylindrocladium buxicola is a new disease to this part of the world, it could become an issue in the horticulture industry, but, there are many preventative measures that can be taken. To reduce the spread of the disease and in turn the effect it has on the industry. By carefully monitoring the plants that are susceptible to the disease, by making sure that there is high air circulation and proper temperature the spread of the box blight can be controlled. In regards to composting purposes, composting in a nursery or in another amateur composting facility is not recommended as the pathogen can live for up to five years. The pathogen dies at a temperature of 33°C which would indicate that composting in a professional facility that is implementing a composting procedure which uses higher temperatures is acceptable. For instance, GroBark Organics Inc. composts at temperatures higher than 55°C, which is well above the temperature at which the pathogen dies. Therefore, provided that the composting is done at a temperature that is above 33°C will yield compost that does not contain any spores of the boxwood blight. Goodwin, Peg. "The Gardening Guru: Box Blight is a New Pest in North Carolina." (2012)Print. Henricot, Beatrice. "Box Blight Rampages Onwards." Topiarus 6: 28-30. Topiarus 5.28-30 (2006): 153. Print. Ivors, Kelly, and Anthony LeBude. "A New Pest to the U.S. Ornamental Industry: The "Box Blight" Pathogen." (2011): 1. Print. Rhode Island Department of Plant Pathology, Mountain Horticultural Crops Research and Extension Center. "The 'Box Blight' Pathogen: Cylindrocladium Psuedonaviculatum = Cylindrocladium Buxicola." (2011): January 2012. Web. Richards, Wally. "Buxus Disease." Articles from July 2010 to April 2009. November 2009.Web. Gogama Screening Project.